Enamor has always led the way in the category of lingerie. It was the first brand that looked at bras from a lens of design & aesthetics. 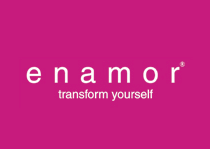 Brand Enamor made bra buying easier for women by appointing counter sales staff and by initiating fitting sessions in the modern retail formats. Brand which did well in the mid-price segment wanted to understand what’s working for the brand Enamor and how the brand could become meaningfully relevant at other price points and to younger age groups. "As a brand, Enamor endorses this mood uplifting, stylish, self assured and inspired attitude of the woman. The enthused playfulness with which we will propagate this brand philosophy will ensure that it resonates deeply with them. We've captured this brand philosophy in our inimitable, thought provoking phrase"
How to create a brand with a distinct imagery in a category which is high involvement yet has limited advertising recall.